This is a really fun dish that is perfect for summer or winter!! Buttery Brazilian Fish Stew is a take on the classic Brazilian dish “Moqueca.” A coconut milk and seafood stock base is elevated with the addition of onions, garlic, paprika as well as sea bass and shrimp. So this is my (accidental) spin on the classic Brazilian fish stew “moqueca.” I have literally had “fish stew + coconut milk, seafood stock, fish, shrimp” written on my never-ending list of recipes to make for, well, forever. So last weekend I sat down to finalize the recipes I would be making and I finally decided it was time to cross that one off my list! Well, I start putting my recipe together and I am doing some research, getting inspiration for my photo shoot …. and I keep coming across all these recipes for a fish stew called “moequeca” …… and it included almost all of the same ingredients I had already written down!! Apparently, moqueca is traditionally a coconut milk-based stew/soup with onions, tomatoes and garlic as well as fish and other types of seafood. Ummmm was I a Brazilian in a past life – maybe? I don’t know, but it was the oddest thing. I swear I had never eaten it before, never looked at a recipe for it before…. but apparently I came up with a new dish that was, in fact, very, very old. Sooooo yeah. I rock. And, apparently, so does moqueca. Sweet Curried Rice Noodles + Shrimp and Roasted Vegetables is a take on Bangkok Curry that is sweet and savory and will please any crowd! Goal: re-create one of my favorite take-out go-to’s: Noodles & Co.’s Bangkok Curry. Goal accomplished. You guys, these noodles are YUMMY. 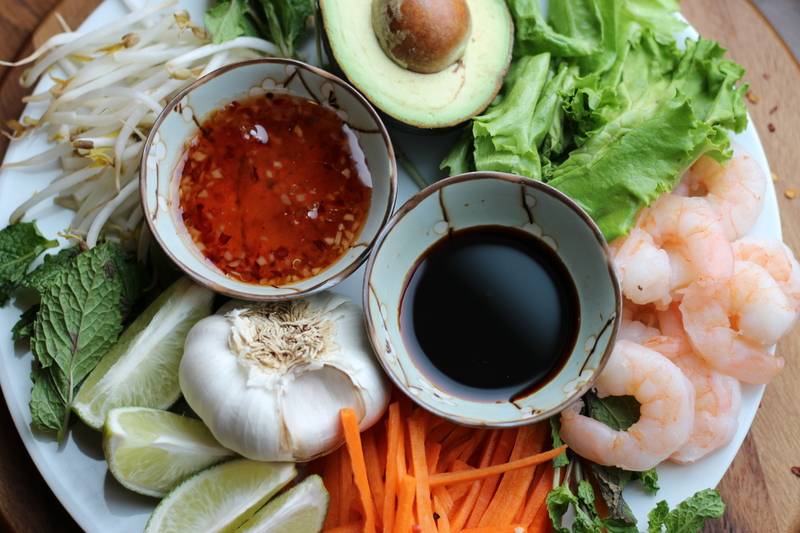 The sauce – I could drink it all by itself, but won’t, because it tastes so damn good wrapped around the rice noodles and mingled with the broccoli, mushrooms, cabbage and shrimp. It is healthy, delicious and will leave you wanting more…. This a great recipe to throw together for a lunch or fun appetizer that guests can put together themselves. It is healthy, fresh and kind of goes with the ever popular “raw-food” movement. Putting together a plate, like the one pictured above, is a fun and bright centerpiece for everyone to pick their favorite ingredients off of. The first step is to get the Thai Dipping Sauce going in a sauce pan. You simply combine your rice vinegar, regular vinegar, fish sauce, water, sugar, crushed garlic clove and chili garlic sauce into a sauce pan and reduce until it has the thickened consistency you want.